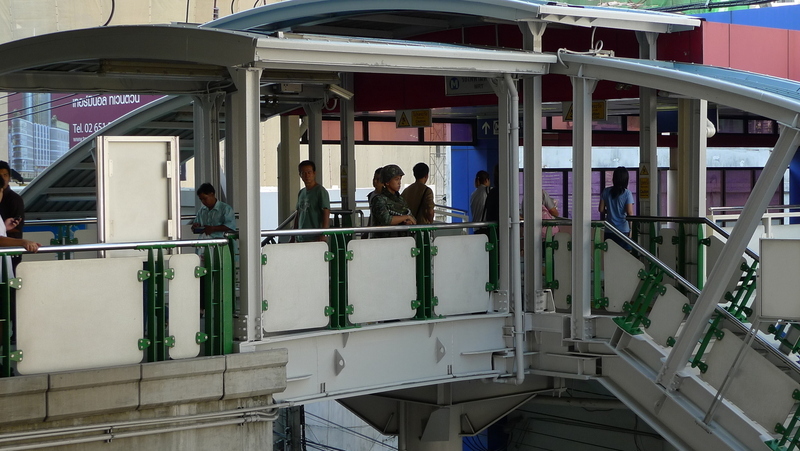 In the wake of a temporary disruption of the BTS Skytrain on Wednesday – the Red Shirt guards had entered the Chidlom station overnight and piled tires on the platforms, threatening to dump them on the tracks in order to prevent troop movement by train – the government has stepped up security at key intersections and transit stations. The Skytrain disruption lasted until 10 am, ruining the commutes of tens of thousands of Bangkok residents and putting the streets into chaos. 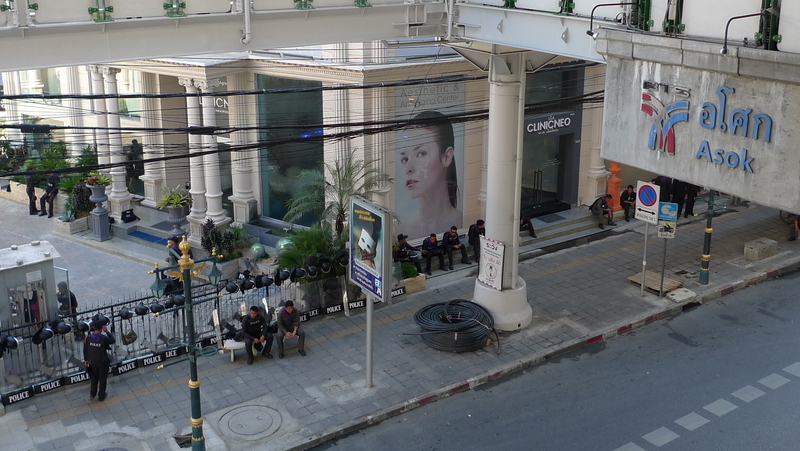 The police and army have set up checkpoints in a wider circle around the main protest area, stretching back as far along Sukhumvit Road as the Asoke intersection. This is three stations before the Chidlom station that was threatened by the Red Shirts. There appear to be maybe 100 officers and soldiers at the Asoke intersection, but no active stopping and searching of vehicles. 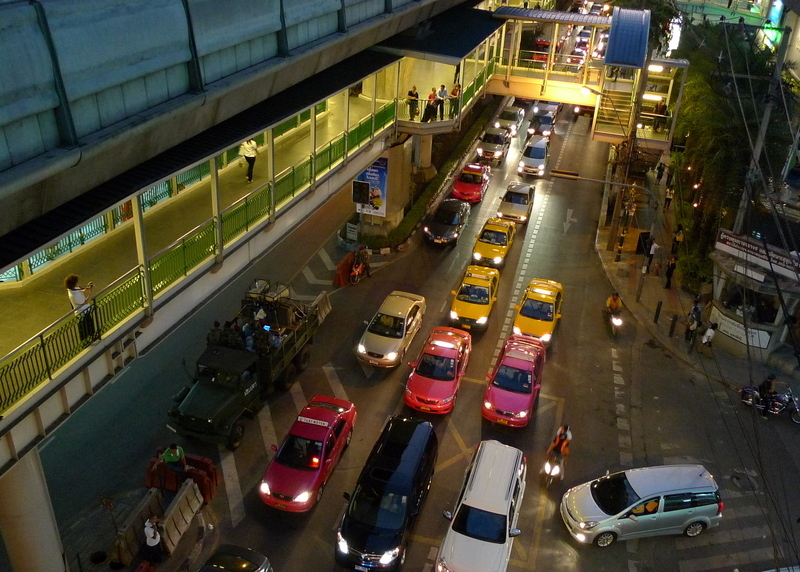 A half-dozen soldiers were posted on the overhead walkways that span the intersection and connect the Skytrain to the subway. This is the first time I’ve ever seen this level of security. 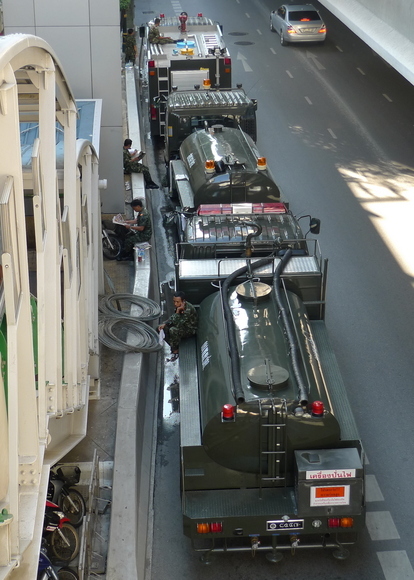 Down on the street there were a pair of water trucks along with a mobile fire fighting unit / water cannon. These checkpoints and stationing of troops are probably in response to another incident this week in which about 2,000 of the Red Shirts decided to conduct a “tour” and head to a wet market in the north side of the city to reach out to residents and explain their side of the situation. The army, tipped off, set up a blockade and engaged the protesters, who eventually retreated. Unfortunately, one soldier was killed, apparently by friendly fire. One of the more interesting sights was this portable audio truck (beneath the pedestrian bridge) from which soldiers are broadcasting “information” (pro-government publicity) and patriotic songs. I’m sure the guests at the Westin (to the right of this picture) and the Grand Sheraton (to the left) are really pleased about that. The Skytrain is running shortened hours until only 8:00 pm each night. Whether or not this will be resolved soon is anyone’s guess. I get the impression that the government is taking a “wait and wear them down” approach, figuring that the tighter they close the access to the protest area, the harder it will be for the protesters to sustain their momentum. Will it work? Who knows? hey, just be careful there. Yeah please be careful.So other than the yellow vs. red shirts, how’s the atmosphere or just walking around the street? Is it disrupting everyday lives of citizens? How about tourists? Your last photo brings back memories when I was doing karaoke at the Westin. That area has a lot of pedestrian traffic and street vendors. Just be careful while you are taking photos! Well, I guess it’s a ‘wait n’ see’ period now, right? I assume this is the most intense Thai political situation in ages. I can’t imagine if our public transport was attacked. We’d be in big trouble. Do many people rely on public transportation there? @Dezinerdreams – Since 1992, although the airport shutdown in 2008 by the Yellow Shirts was a pain, too. @TheCheshireGrins – The Skytrain is a major transit line into the business district and somewhere in the neighborhood of 450,000 trips are made on it each day. @CurryPuffy – Interestingly, taking pictures with the soldiers is a popular pastime for Bangkok residents! @yang1815 – Tourist arrivals have dropped by more than 40% year-over-year. For everyday life, the Skytrain is closing at 8 instead of 12 so nightlife and even evening activities like movies, shopping, dining out are affected. Most people are just heading home. @Renatojr3 – Will do, thanks. @vsan79 – Interesting, definitely. @christao408 – Yikes… Hope it ends peacefully soon. Be careful and stay clear of rubber bullets!!! I just heard a news clip on npr and got worried about you! @kenpcho – Well, thanks for the worry but let’s bear in mind that the media tends to lack perspective and context. I think your next video blog should be from the water cannon truck. Is the general population getting tired of all of these blockades, delays, disruptions to their lives? At some point, I’m sure even the most sympathetic supporters will eventually lose patience. @ElusiveWords – Yes, that is a large part of the government’s strategy. Wait them out. Rainy season is coming – no kidding, there’s a huge thunder and lightning storm even as I speak although it has yet to rain – and at some point the rural protesters will lose some momentum and some will want to get back to their fields to plant the new season of rice. That won’t solve the problem, of course, but there are those in the government who would like to think it would.